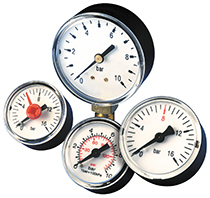 The Model 570 and 915 are low cost pressure gauges that can be customized for any OEM’s requirements. The Model 570 is a 2” pressure gauge, with brass/phosphor bronze wetted parts and a light weight plastic dial and case. The Model 915 has a snap-in style window, in economical metric designs in 40mm, 50mm, or 63mm with an ABS dial, pointer, and case. Please view our data sheets for more information. Request more information to see how we can help you with a pressure measurement solution that fits your exact needs.